Djibril N’Doye is an internationally recognized artist with artwork in galleries, universities, homes, and businesses throughout West Africa, the USA, Mexico, Cuba, Western Europe, and Japan. He has received numerous awards in recognition of his talent as an artist. 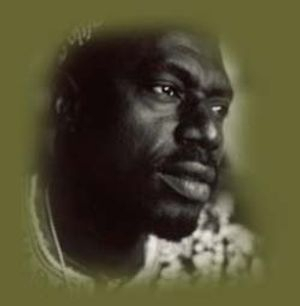 Recently the subject of an 81-minute documentary film "Ndap li-Djibril N'Doye Lebou Artist", Djibril attended its world premiere at the Pan African Film Festival in Los Angeles CA in February 2004. This film explores the life and unique woodburned artwork of Sierra Madre, California based artist Djibril N'Doye who is from the Lebou tribe of Senegal in West Africa. The film includes interviews with the artist in Wolof, the native language of the Lebou people, with English subtitles, and interviews with both African American and white American collectors. "Taking Root and Blossoming", Djibril's celebrated 1995 ballpoint pen drawing, was selected for the program cover of the National Council of Black Studies 20th Annual National Conference held in Washington, D.C., in November 1996. Djibril N’Doye considers his work to be “universal” art, and his style of drawing is inspired by sculptures in ebony. Processing images of different pieces of the dark hardwood, he is able to create the effect of transparency in his art. The drawings portray a variety of scenes from daily life based in his native West Africa. Previously working with standard materials such as oil paint and watercolor, Djibril developed his own distinct technique using only ballpoint pen during a half dozen years of research and experimentation. After taking the ballpoint pen drawings to a very high level of professionalism, Djibril began using charcoal pencil on larger surfaces to further develop his intensely emotional detailed drawing style. His newest beloved creations are drawn directly on wood with a woodburner (pyrography). Born in 1953 in Bargny, Senegal, self-taught, and a member of the National Association of Artists/Graphists of Senegal (A.N.A.P.S. ), Djibril N’Doye’s public life began when he won First Prize in 1981 for an exhibit at the Popular Educational Center in Rufisque, Senegal. The following year he was awarded First Prize at the Blaise Senghor Cultural Center in Dakar, Senegal. This recognition led to a solo exhibit at the Daniel Sorano National Theater in Dakar in 1984. One year later, Djibril founded Suunu Nit Artists Group in Bargny, his hometown, with the objective of encouraging and developing local artists, painters, and writers, and helping support Bargny's own artistic community. From 1992-1995, Djibril regularly exhibited his work at the Hotel Savana in Saly de M’Bour, from which over 150 original drawings were sold worldwide.